Why would anyone write a book on printing science? Modern printing technology is so sophisticated it might as well be magic, so no one needs to read a book about it. That's true. But I found it to be an interesting challenge to learn lots of new (to me) science and to dig out lots of obscure references from a time when printing was expanding and fundamental work was still being carried out. It is clear that printing is still very far from being well-understood and properly controlled, so there really is a need for a book which sees behind the deceptive myths and offers deeper insights into the key processes. As with all my books, key formulae are brought to live via apps and you just click on the link in the eBook to go straight to the relevant app page. The book is Copyright © 2018 Prof Steven Abbott and is distributed under the Creative Commons BY-ND, Attribution and No-Derivatives license. You just click to download it and start reading in the format of your choice. By linking to Practical Coatings you get all the benefits of the live apps. On an iPad, for example, a click on a link takes you to see it in Safari and a 4-finger swipe allows you to go back and forth between book and app. On a laptop it's even easier to swap between the two views. You can download it in any format(s) you find useful. The table of contents in each of the formats (including PDF) is "live" so it is very easy to find what you want. Most eBook readers have a search function so the book doesn't need or have an index. You can choose your reading experience. Some like to read page-by-page but it can be difficult if a diagram or a formula is on a different page in your specific view. Others like a scrolling view which is less book-like but is easier to move back and forth to check diagrams and formulae. With formats other than PDF there is an issue about footnotes. The best eReaders allow pop-up footnotes which just appear when you click them, but such support is erratic so I have placed all footnotes at the end of the paragraph - the least bad option. PDF. 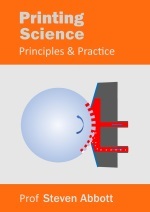 Printing Science Principles and Practice.pdf. [If you want to download it, use right click.] On a high-res tablet or laptop, PDFs offer a good reading experience and it is the simplest to get going; on a smartphone it may be less pleasant to read. ePub3. 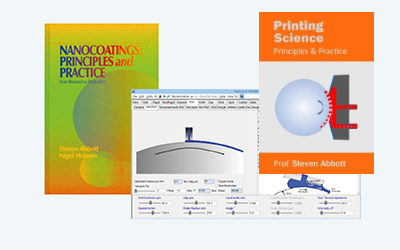 Printing Science Principles and Practice.epub. This works on phones, tablets, PCs, Macs with modern ePub3 readers such as iBooks, Calibre, Azardi, IceCream etc. How do you get it into, say, iBooks? I use Dropbox on my iPad and choose iBooks to run it. You may find other ways via, say, email. Kindle mobi. Printing Science Principles and Practice.mobi. Mobi is generally agreed to be a deeply unsatisfactory format and it is frustratingly hard to get the format right, but Amazon continues to use it so we all have to produce it as best we can. This version seems to work OK but don't blame me if there are glitches. How do you get it into your Kindle reader? On my PC I simply put the file into the My Kindle Content folder and run Kindle for PC (it won't work on the Windows App version) where it automatically appears in my available books. I don't have a stand-alone Kindle reader so I don't know how to get it on to one of those, but I believe it is not too hard. For simplicity/reliability, footnotes are at the end of the relevant paragraph. One of the joys of producing my own book and giving it away is that I can rapidly respond to the reader community. I can quickly fix typos, reword passages that are unclear, improve the layout within a given reader. More importantly, if there is science that is incomplete, wrong or missing I am happy to do my best to fix the problem. I can't do this without your help, so please email me at steven@stevenabbott.co.uk if you want me to make improvements. Where does the science come from? My task has been to find the good, useful scientific principles and distill them into words and apps that allow people like me to use the principles in practice. In addition to reading books and many 100's of academic and conference papers, I've had the chance to interact personally or via email with many of the world's printing science experts. All through the book, and in any app where I needed help with the algorithm, I acknowledge their generous inputs. All the credit for the science goes to them. All the blame for errors in describing and implementing their science goes to me. 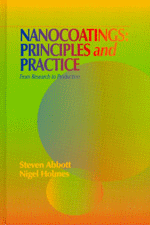 Dr Nigel Holmes and I wrote Nanocoatings: Principles & Practice with a key goal. We wanted the book to be one that would have saved us a lot of bother in our careers developing nanocoatings. In particular, we wanted to make sure that we provided useful formulae in a form that readers (and ourselves!) could use. This meant that an Excel workbook (free, no strings attached) was provided for download. We're happy that the book and Excel have both been a great success. However, technology moves on and it seemed a good idea to put the key calculations into app format, with some short explanations. So Practical Nanocoatings was born and was mostly at readers of the book - though the apps were still useful to those who don't have a copy. You are welcome to use the apps without the book's guidance but we think you'll get even more out of them if you get the book for yourself. If we didn't think that you'd find the book useful, we wouldn't have written it! Do you really want to go nano? Why Do We Need Nano? There are plenty of good reasons, but plenty of reasons why it might be a bad choice. How the nanoparticles are made has a big influence on whether they are suitable for you. Choosing the solvents rationally (e.g. via HSP) can avoid a lot of problems. How you coat, print and dry can have a big effect on performance. Putting nanoparticles into surface structures. Have the Nanoadditives Done Their Job? How do you test whether the nano materials have really increased performance? A calm approach to a topic that often creates panic. My Printing Science book is a free eBook. My book on Nanocoatings with Dr Nigel Holmes is from DesTECH. I am one of the RheoLogic co-authors of the TopCoat package that accurately models coating , drying and defect analysis, all in an easy-to-use format. The Web Handling link takes you to AbbottApps written with Dr David Roisum, Dr Dilwyn Jones & Tim Walker.